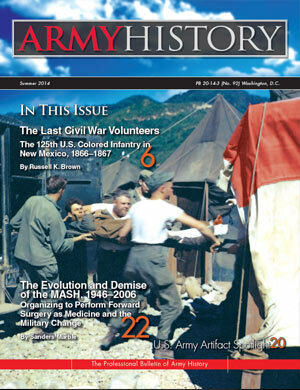 The Summer 2014 issue of Army History features two articles on very disparate topics. The first article, by Russell K. Brown, a retired Army officer and independent historian, details the saga of the last Civil War volunteers to be mustered out of service-the 125th U.S. Colored Infantry. This unit, recruited mostly from Kentucky slaves in early 1865, performed garrison and guard duties in Louisville until it received orders to proceed to the New Mexico Territory in early 1866. The regiment arrived in New Mexico and accomplished its missions admirably, although not without its trials and travails. Brown captures the 125th’s grand adventure well and still manages to put a very human face to the story, primarily through the use of diaries and personal letters. The next article, by Sanders Marble, the senior historian with the Office of Medical History at Fort Sam Houston, chronicles the inception, rise, and ultimately the fall of the Army’s Mobile Army Surgical Hospital (MASH). The introduction of forward surgery elements, or mobile hospitals capable of executing complicated surgeries close to the front lines, came during the First World War and drew heavily from the British and French experiences. Marble examines the evolution of this type of unit as the Army’s needs changed throughout the courses of World War II, the Korean War, the Vietnam War, Operation Desert Storm, and finally into the twenty-first century. The artifact in this issue’s Army Artifact Spotlight is an interesting and timely piece as the seventieth anniversary of the D-Day landings is upon us. The chief of military history, in his Chief's Corner, discusses the ongoing Army-wide effort to collect operational records from the Global War on Terrorism in order to support the writing of official histories. Because the Center of Military History has now been designated the sole repository for these records, we are working to overcome the inherent challenges that come with gathering, safely storing, and providing accessibility to hundreds of terabytesworth of information. In his Footnote, the chief historian talks about the fiftieth anniversary of the Vietnam War, furnishes some background to the opening stages of the conflict, and highlights the first brochure in the Center’s U.S. Army Campaigns of the Vietnam War series. I continue to invite readers to send me their articles and commentaries on the history of the U.S. Army as well as their thoughts and comments on this publication.